150ish is a free weekly newsletter that brings you all the dish on local food artisans working within 150 miles–more or less–of New York City. We love to share our passion about great local resources with our friends and families–and 150ish is our way to share that passion with everyone. Each week we feature a food product from our 150ish area: we buy the products, we taste the products, and we only tell you about what we like. Mmmmm…butter. It’s one of 150ish’s favorite foods. Our discovery of ghee changed the way we cook, so when we heard that a pair of Eleven Madison Park alumni were crafting small batches of brown butter in Brooklyn, we had to check it out. 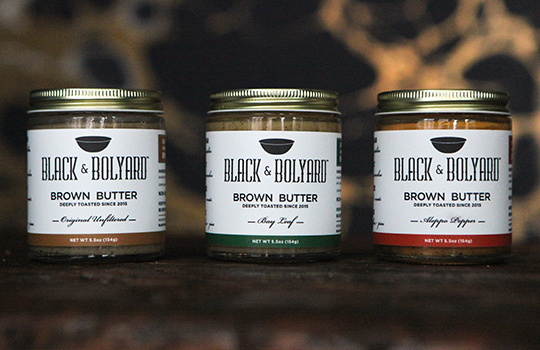 What we found are jars of deliciousness—nutty, toasty, perfectly browned butter made by Andrew Black and Eric Bolyard under the label Black & Bolyard. After one taste, Francesca and Marisa immediately cleared more space next to their stoves. Here’s the dish. Let’s talk a bit about butter—and why yours should always be made with milk from grass-fed cows. First of all, it tastes better. Also, dairy from cows fed a diet of grasses (as opposed to grain) is much higher in vitamin K and omega-3s, both of which are very important for a healthy heart. If you take that grass-fed butter and cook it very slowly over low heat to separate and remove the milk solids, you will have ghee, which is excellent for cooking thanks to its higher smoke point. But if you take that grass-fed butter, cook it very slowly over low heat to evaporate all the water, then raise the heat to carefully toast those milk solids to a beautiful deep brown, you will have brown butter, or what the French call beurre noisette. It is one of those magical ingredients that will elevate any dish, whether savory or sweet. Eric and Andrew met while cooking at the acclaimed Eleven Madison Park in 2011 and worked there together for three years, after which each left to do some travelling and explore other types of cuisine. Returning to New York, they collaborated on an underground supper club, called Tasting Society, serving pop-up dinners in Williamsburg. A dish of whipped brown butter was one of the first things set on the table and it consistently garnered raves. Realizing its potential as a product, the pair put Tasting Society on hiatus and took a leap; they’ve been making brown butter commercially for about a year. Once you’ve wowed your Super Bowl guests with brown butter popcorn, 150ish suggests a great bowl of chili accompanied by Eric and Andrew’s incredible cornbread. We recently attended a chili dinner prepared by our friend Midge Keator and it was so delicious, we asked for the recipe. Of course, it came from the great Rick Bayless and his daughter Lanie—this really is the Worlds Greatest Chili. Eric and Andrew developed this cornbread recipe in conjunction with Field Company, whose beautiful cast iron skillet is highly coveted by Francesca. In a small bowl, whisk together the milk and eggs. In a large bowl, whisk together the cornmeal, flour, sugar, salt, and baking powder. Add the egg-milk mixture to the flour mixture and stir until well combined. Heat a 10-inch cast-iron skillet over low heat and add the brown butter. Once the butter has melted completely, increase the heat to medium-high and pour the prepared batter into the pan. Transfer the pan to the oven and cook, uncovered, until the top is golden brown and a cake tester comes out clean from the center, 17 to 20 minutes. Enjoy warm, spread with more Bay Leaf Brown Butter. Copyright © 2017 150ish. All Rights reserved.